F-4N Phantoms were F-4Bs refurbished in 1970 under a program called Bee Line. Altogether 228 Bs went through the programme in NAS North Island, California, where they were stripped and inspected. They were then completely rebuilt using new parts. The changes included a structural strengthening to extend the fatigue life, plus a complete rewiring. They retained the engines (albeit with some smoke abatment equipment), thin wings and tires, the main radar, and the undernose infrared search and track detector of the F-4B, but were fitted with an F-4J-style slotted stabilator. The F-4N was fitted with Sanders AN/ALQ-126 or -126B deceptive electronic countermeasures equipment, in longer fairings than those used by the same equipment on the F-4J because of the difficulty in routing the cables. Other changes included a helmet sight Visual Target Acquisition System (VTAS) and a Sidewinder Expanded Acquisition Mode (SEAM). A new dogfight mission computer was provided, together with auto-altitude reporting equipment. APX-76 or APX-80 air-to-air IFF equipment was fitted, plus AN/ASW-25 one-way datalink. The last Navy F-4N was retired from VF-201 based at NAS Dallas, Texas in February of 1984. The last Marine Corps unit to fly the F-4N was VFMA-134, which relinquished the type in 1985. A long time ago, in the 1980’s, I used to admire the 1/72 Fujimi Phantoms as “serious” kits with good attention to detail. The newer Hasegawas are a step forward, with extra finesse, a better proportioned cockpit (though still completely bare) and better lines (though I still miss the “standard armament package” coming in any Fujimi Phantom!). The kit used is the VF-111 boxing, HSG00365, complete with special decals. An Eduard PE 73207set was thrown in, with some armament provided by the Hasegawa Weapons Sets nos.III (Sidewinders) and V (Sparrows) for good measure. The kit is produced as a “multimould”, allowing many different versions to be built, so its breakdown is a bit complex; on the upper side, lots of extra parts are provided. This particular boxing is a bit inflexible, because it comes with the “thin wing” exclusive to the F-4B/N (and RF-4B), but extra parts include both types of A/B cans, all kinds of fin tips, instrument coamings, ECM fairings and other details. 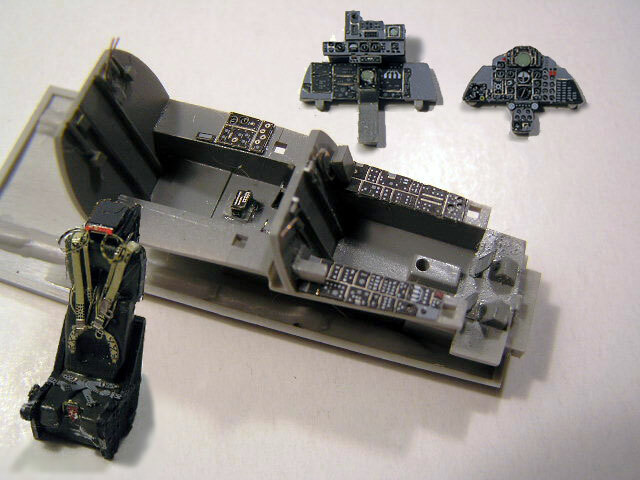 The PE set fits wonderfully on instrument panels and consoles, but the sidewalls and the bathtub are left a bit bare, so they received some structural detail. Though the seats are customarily replaced by aftermarket pieces, the ones in the kit look reasonably good and can be greatly enhanced with the PE parts, so I kept them (at some time one of the shoulder belts dropped off, you can see that in the photos!). The rear seat was raised a couple of mms as per the Eduard instructions. The whole cockpit was painted FS 36231. The fuselage went together without inconvenience, taking some care in the alignment of the front and rear parts. Some filler is necessary in the joints at the lower nose pan, the intakes, and the lower fuselage. I did not do anything in the intake trunks area. The wheel wells receive some detailing with plastic scraps and wire. I chose to open the air brakes, taking advantage of the “flat” wing: in a “bulged” wing, the operation of adapting the PE brakes would be infinitely more difficult. The area was hollowed by the “hole and scribe” method; the fit of the PE pieces is perfect. The interior of the exhaust cans was detailed with some Tamiya tape cut to strips and fixed to mimick the petals. In any “modern” fighter-bomber, the task of building the external load is almost as tiresome as building the aircraft itself; moreover, some research is on order, for the loads are always very specific, and they are seldom seen carrying the wide variety and quantity theoretically possible. In this case, I have seen that, though USAF’s Phantoms almost invariably carried the “Sgt. Fletcher” wing tanks, Navy’s often made do with only the centerline one. Also, I found that the weapons load, in certain type of CAP configuration, was reduced to four AIM-9s and just two AIM-7s, these being carried in the rear bays. Good Sparrows being a scarce commodity, I opted for this configuration. The Sidewinders are the -9D/G variant, typical of Navy aircraft in the mid-seventies; it is amazing the number of kit producers and model builders alike who include the wrong subtype and should know better. Some antenna blades were replaces by PE parts; these greatly increase the finesse of the model. Being a very light, glossy scheme, it is very hard to obtain an interesting look with the regular Navy FS 16440/White scheme, let alone a realistic one. I preshaded the model extensively, with a Brown-Black concoction, both freehand and masking. After painting each color, I mixed slightly different shades using greys and tans to impart a different look to certain panels. After all the hard airbrush work, the model still looked hopeless until the very last steps involving oil washes and pastel powders. The metal zones at the exhausts and tailplanes should be treated with some care in any Phantom model. I painted the whole lot with Alclad Aluminium, then the dark zones with Testor's Magnesium, and then did some postshading with Gunmetal. For the exhaust themselves, a first coat of Gunmetal was followed with some Alclad Burnt Metal, for a warm copperish look. I used the kit’s decals, being of the highest quality and performing flawlessly on the nice glossy surface. Even the walkways and the antiglare band came from the decal sheet, and the fearsome looking sharkmouth did not pose any problem, provided that you place it correctly to start with. The Red trims were, however, painted, after obtaining as best a match as I could using Xtracolor Insignia Red and drops of Black. The same mix was used to compensate the irregularities in the big “Sundown” fin badge. Once you are into it, it is difficult to leave the Phantom stream. There are hundreds of them. At first, they look all the same, then all different, then all the same again (just like the 109s and 190s!). Fujimi Phantoms were not bad, but the Hasegawas’ are excellent kits, of the highest quality, relatively easy to assemble, and with the addition of the PE they look very, very good. Particular boxings come in and out of the market, but new editions are always coming, and with the in-built options, and the plethora of aftermarket decals available (though they also come and go) you can hardly miss your target. “The McDonnell Douglas F-4 Phantom II, A Comprehensive Guide, Part 2: US Navy and Marine Corps Variants”, Andy Evans, SAM Limited.